The STH-14 combination soil test kit uses simplified colorimetric / visual methods for analysis of readily available nutrients. The extractant used is Morgans Universal extractant. 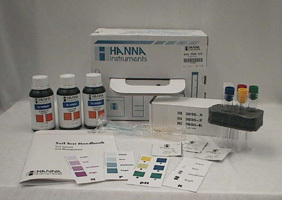 The STH-14 measures pH (100 tests), nitrate. 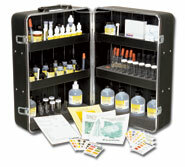 phosphorus, potassium, humus, calcium, magnesium, sulphate, chloride, aluminium, nitrite and iron (each 50 tests). Each kit includes complete instructions and a soil management handbook. For detailed information please follow this product link to the Lamotte website.